San Antonio Spurs head coach Gregg Popovich during a game against the Oklahoma City Thunder on Nov. 17, 2017. 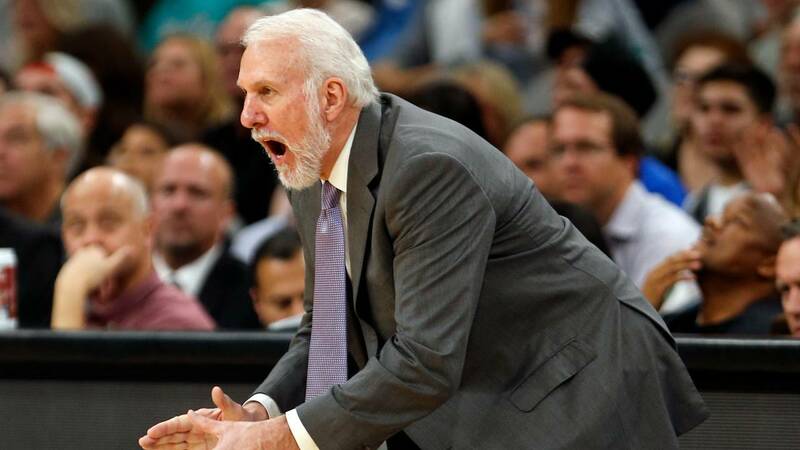 (CNN) - Gregg Popovich has never shied away from speaking his mind. So its no surprise that the legendary coach of the San Antonio Spurs, a winner of five NBA titles, had a strong response when asked why it's important for the league to celebrate Black History Month. "I think it's pretty obvious. Our league is made up of a lot of black guys," Popovich told reporters Monday before the Spurs took on the Utah Jazz in Salt Lake City. "To honor that and understand it is pretty simplistic. How would you ignore that? More importantly, we live in a racist country that hasn't figured it out yet. "It's always important to bring attention to it, even if it angers some people. The point is, you have to keep it in front of everybody's nose and understand that it still hasn't been taken care of and we still have a lot of work to do." "This man in the Oval Office is a soulless coward who thinks that he can only become large by belittling others. This has of course been a common practice of his, but to do it in this manner -- and to lie about how previous presidents responded to the deaths of soldiers -- is as low as it gets." -- in a call to The Nation writer Dave Ziri, after President Trump falsely claimed his predecessors hadn't written or called the families of slain American troops during their tenures. "I feel like there's a cloud, a pall over the whole country in a paranoid, surreal sort of way. It's got nothing to do with the Democrats losing the election, it has to do with the way one individual conducts himself, and that's embarrassing. It's dangerous to our institutions and what we all stand for and what we expect the country to be." -- before the Spurs played the Golden State Warriors in the Western Conference Finals. "It's still early and I'm still sick to my stomach. Not basically because the Republicans won or anything, but the disgusting tenor and tone and all the comments that have been xenophobic, homophobic, racist, misogynistic, and I live in that country where half the country ignored all that to elect someone. That's the scariest part of the whole thing to me." -- just days after Trump's shocking victory in the 2016 presidential election. Popovich is also head coach of the US men's basketball team, which means he will be leading the country's highest-profile team during the 2020 Summer Olympics in Tokyo -- giving him an international platform for his opinions.